There are many ancient cultures that have existed in Peru as the Tiwanaku and Inca, who have left an immense legacy of pyramids, temples, artifacts and utensils which undoubtedly show their incredible skills and knowledge in technology, astronomy and engineering, that according to history, they should have not had. All these incredible relics of history have given the world something to talk about and admire, but most importantly something to question. We have to understand that the ancient Peruvian cultures have been underestimated by modern-day scholars. There have also been many raised questions from some of the ancient texts and depictions left behind by these ancient cultures. Some of them, could be closely related with extraterrestrial beings. We are not trying to discredit our ancestor but are simply trying to understand the pieces of information that they left behind, suggesting they had contact with beings not of Earth. One of the most talked about ancient cultures of the region are the Tiahuanacos. 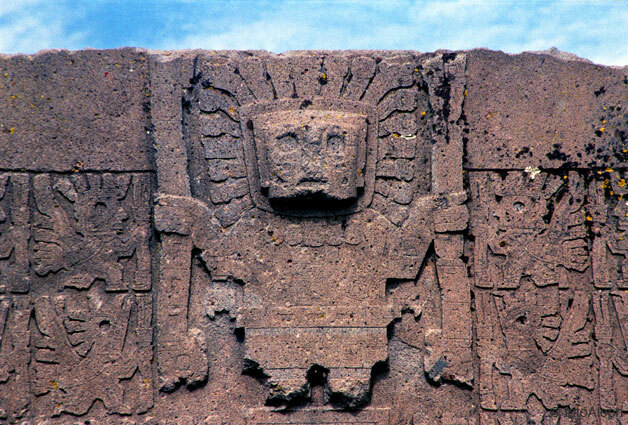 According to historians the Tiwanaku culture developed in Bolivia, around 1500 BC, near the present city of La Paz. This ancient culture spread to southern Peru and northern Chile reaching its peek between n the IV and X centuries AD. Tiahuanaco, like many other ancient cultures vanished mysteriously around the twelfth century. The reign of Tiahuanaco lasted for about 2500 years, but despite all the incredible pieces of history they left behind, we know very little about them. The monuments they left behind point toward an extraordinary ancient civilization with amazing architectural, astronomical and hydraulically skills. Their stone masonry skills are literally out of this world. Mainstream scholars cannot fully explain how they managed such precise and perfect cuts. Stone blocks have been placed in such a way, that not a single sheet of paper can fit between them. The transportation of these blocks is another mystery since some of the stone blocks weigh over 50 tons. The geometric design of some of the stones in the region is something that has never before bees seen. 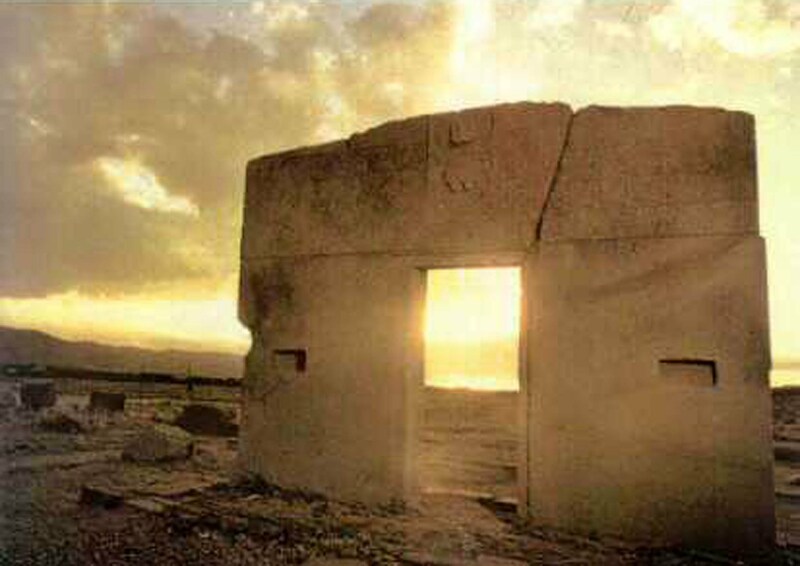 At Tiahuanaco we find the “Puerta del Sol” which, according to many ancient astronaut theorists is believed to be some sort of dimensional gate, or it was used in the past as one. According to archaeologist Arthur Posnanky, the temples the ancient Tiahuanaco civilization made was designed with polished stone blocks that have several rows of small round holes, according to Posnanky, they could have been used to hold something in the distant past. These round holes are so precise that it is hard to believe that ancient civilizations made them without some sort of advanced technology. In 1943, Posnanky presented his theory that golden nails were placed inside these perfect holes and concluded that they served to hold large heavy pieces of gold that covered the walls and temples of Tiahuanaco. Ancient Astronaut theorists believe that the Anunnaki settled in the area of Tiahuanaco and Lake Titicaca, where they developed a mining civilization that extracted gold, silver and other metals found in abundance in the region. It has been established by historians and ancient manuscripts that Tiahuanacos would have been the predecessor of the great Inca culture. The legend of the founding of the Inca empire states that the first Inca Manco Capac and Mama Ocllo came from the depths of Lake Titicaca and established the ruling empire by sinking a golden staff in an adjacent field to Lake Titicaca.